Created by 11 talented designers, these 15 sweet patterns are all packed with personality and introduced with a story behind them – and every one is finished with those tiny details that make all the difference to the finished product. Our favourites include Lonzo the Llama by Ilaria Caliri, carrying a colourful tasselled blanket, Kristi Tullis’s Xander the Zebra with stripy mohawk and the chubby-cheeked Hamish the Hamster from Janine Holmes, clutching on to his tiny strawberries as if afraid someone will steal them away. And the chunky Scraps the Seagull will bring a smile to the face of anyone who’s ever had their chips snatched while wandering down a seafront! 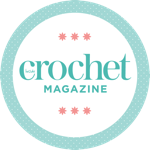 The book begins with a guide to crochet and clear illustrations, and every pattern has written-out instructions plus step-by-step photos for any tricky parts, so though detailed, the designs should be perfectly achievable to a beginner crocheter. And with amigurumi as sweet as this, we think even the most nervous crocheter will be enthusiastically hooking away in no time!